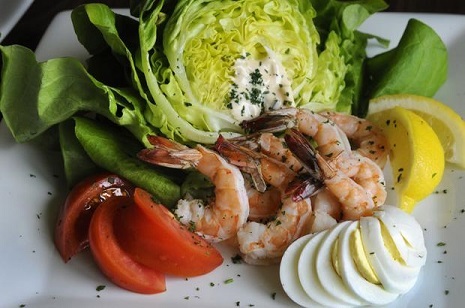 Butter lettuce is used for this Prawn Salad with Avocado and Tomatoes is often called Boston or Bibb lettuce. I am not certain, but there may be slight differences. I guess it doesn't matter because all are good quality lettuce that will have fairly large, loose and thick leaves and an even green coloring. The lettuce is excellent for flavor, texture and nutrition. Butter or Boston or Bibb lettuce is available all year long in California and Arizona. I know, I have purchased this lettuce fresh from their fields at various times of the year. In Washington State, where I live, butter lettuce is available from May through late September. The flavor of butter lettuce is so "gentle" that it is perfect with many, many other foods and dressings. 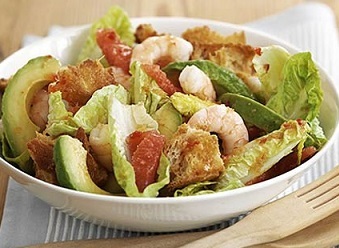 This salad recipe has approximately 12 grams of carbohydrates per salad plus 2 carbs for each 2 tablespoons of Thousand Island Dressing. So for those of you who are carb counters, this is a wonderful salad recipe to add to your file. 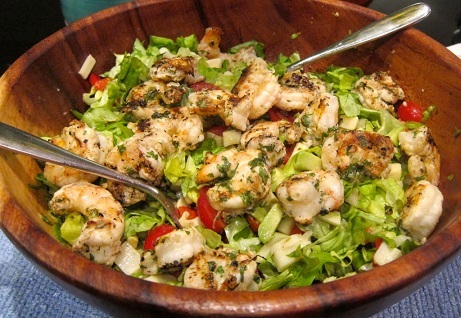 Enjoy your Prawn Salad and the company of those you share it with! Did you know? Shrimp and prawn are common names without the formal definition that scientific terms provide. They are terms of convenience.